The rap titan has bought Armand de Brignac from New York's Sovereign Brands. Sometimes it feels like rap heavyweight Jay-Z owns 99 businesses, but until now a luxury champagne brand hasn’t been one. Today the rapper, real name Shawn Carter, snapped up Armand de Brignac, known as Ace of Spades, from Sovereign Brands. The champagne, which is generally sold for around $300 (£188) per gold-coloured bottle, is made at Cattier House in Chigny-les-Roses, where it was founded in 1763. 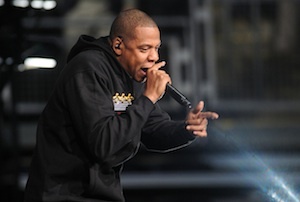 ‘We are proud to announce that Sovereign Brands, a New York-based wine and spirits company owned by the Berish family, has sold its interest in the Armand de Brignac (‘Ace of Spades’) Champagne brand to a new company led by the globally renowned Shawn ‘Jay Z’ Carter,’ the New York-based business said in an amusingly sober statement. Carter is no stranger to the business world and has even appeared on the cover of Forbes alongside Warren Buffett. Like a lot of ‘celebrity entrepreneurs’, it’ unclear how much of a role he has in the day-to-day running of his companies, which include the upmarket sports bar 40/40 Club and the clothing brand Rocawear. He also has stakes in the Brooklyn Nets basketball team and cosmetics company Carol’s Daughter, and a joint venture with battery makers Duracell. Last week MT reported that Carter’s wife, Beyonce, had signed a joint venture with Topshop to launch a new range of trendy/impractical sports clothing. The couple are thought to have a combined net worth of more than $1bn.